– Simon & Garfunkel, The Boxer, Live Concert In Central Park. I enjoy listening to Simon & Garfunkel. As I see it, life is like their music … it changes, and it doesn’t. Of course, some of you who are on the road and just now developing a code that you will live by (until that changes, too) have not yet seen the past become a good-bye. I am often asked, “Hey, Dr. GRANOLA® what was the world of granola like in the early 1970’s as opposed to today?” Now there’s a trip! Many things have changed while a lot has remained the same. One major difference is, today … as opposed to 20, 10 or even 5 years ago … there are way more granola companies offering awesome granola-styled products that compete for the taste buds of a still evolving & growing consumer market. In our future blogs, at Ask Dr. GRANOLA®, we will be highlighting these granola companies, their products, their ‘higher purpose’ and what makes and keeps them appealing in today’s fast paced and challenging marketplace. To truly understand the world of granola, yesterday or today, requires a ride in the Way Back Machine to the old, old, OLD days … circa 1850’s-1870’s. At that time, innovative food marketers such as Sylvester Graham, James Caleb Jackson, Dr. Harvey Kellogg and CW Post, were engaged in the process of experimenting and producing new food products which they sold to a growing ‘health-conscious’ market. Utilizing modern manufacturing methods and combining wholesome ingredients, these cutting edge food inventors responded to the increasing demands from this growing ‘health-obsessed’ market with some pretty funky, new fangled products. Sylvester Graham introduced baked products made from an ingredient he named after himself, Graham flour. 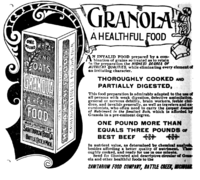 James Caleb Jackson and Dr. Harvey Kellogg (yes, of eventual Kellogg’s Corn Flakes and cereal fame) each developed and marketed a cereal made from whole grains (both initially named ‘Granula’ which Kellogg renamed ‘Granola’). And CW Post concocted a double baked product that, generations later, is still being sold today … Post Grape-Nuts and Grape-Nut Flakes. Consumers responded favorably and an entire new food category was born … ‘breakfast cereals’. However, in order to maintain their steady growth these products had to appeal and adapt to the demands of a larger and growing market. And adapt they did. Using new packaging techniques (ie, the cereal box) and, most important, implementing modern marketing campaigns, the new ‘breakfast cereal industry’ quickly became firmly established as an integral part in the daily lives of folks from the 1870’s and well into the 20th century. How did this all come about? Simple … the solution was ‘sugar’. To capture (some would argue, ‘addict’) the taste buds of the growing commercial cereal market large amounts of sugar were added to these ‘healthy breakfast cereals’ and advertising agencies figured out how to market these sugared cereals to children and their parents. The late 1940’s and early 1950’s spawned a new generation and by the 1960’s & early 1970’s this generation yearned for a healthier & more wholesome lifestyle and diet. Re-enter … ‘granola’. Everything, Everything, Everything … for a reason. And in 1971, in a small town in upstate New York … a batch of granola was baked and my journey began. Consider a life changing ‘Ah Ha’ moment when a seemingly unplanned event, or series of events, sets in motion a new path. For me, this one particular ‘Ah Ha’ moment (out of many) happened when I was 18. I just returned from a sojourn in upstate New York where I received a recipe for this concoction called ‘granola’ and, upon my return home, I began baking it in my parent’s kitchen. There was something mystical, magical & profoundly fun in baking granola. At that time in 1971, I was in college studying for a career in oceanography. My plan was to follow in the footsteps of Jacques Cousteau. Fast forward just a few years … I was driving a cab in Manhattan to help support my growing granola business when I actually drove Jacques Cousteau to the airport! It was Kismet! To this day I recall our conversation about his many adventures aboard the Calypso. But what truly touched me the most was his belief in always following his ‘higher purpose’ and, by doing so, he managed to find sponsors for his many ocean adventures. I shared with him that although I initially studied to work in the field of oceanography, I had a higher calling to become a granola baker. What a wonderful ride we had together! Back in Bayside, Queens – baking this new granola-thing seemed to attract a LOT of people. The delicious aroma of granola baking in the oven wafted throughout the neighborhood and folks would constantly materialize at our house both to assist in the mixing and baking process and share in the joy of the finished results. Over and over again these helpful and appreciative visitors would offer the same comment followed by the same question, “Wow, this smells and tastes wonderful! Can I buy some?” This was not the plan, or was it? And a series of events soon began to unfold that seemed … so natural! As a science and math major, I process most things in a linear fashion … always formulating and calculating each step. However, I am also a big picture thinker and, somehow, I see the wave even before the ripple begins. 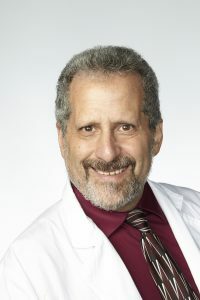 Something new and exciting was happening … healthier eating and healthier living was slowly making its way, again, into American culture and I knew I wanted to be part of it! Enter … another personal ‘Ah-Ha’ moment when I woke up one morning and decided to become a granola baker! To me, it was ‘obvious’ and ‘natural’ what was happening and going to happen in the marketplace. At the same time I was embarking on an ‘unknown’ journey that all seemed to fit well together. Most important … I knew it was the right thing to do. To this day, after changes in my career path and business models … from the science of the oceans to the formulas of baking and from the traditional food ‘pipelines’ to the current World Wide Web and social media markets … my heart, purpose, enthusiasm and belief in a higher good remains … more or less the same! In my upcoming blog installments I will share my life’s lessons and adventures at learning how to run and manage my growing business … while keeping the faith! Next: Part 2 – Crashing Carnegie Hall, It’s BIGGER Than Just Health Foods, and … All’s Fair In Love & Granola! and share with us your exciting business and products! PS – Support your local small batch granola company … good people producing some awesome granola.